Last night we had the pleasure of celebrating as a team at our annual Christmas dinner. We celebrated our accomplishments, our growth, and of course, our survival. Having given it our all, we’re all approaching the festive season a little spent so this was an opportunity to leave the work aside and simply enjoy each other’s company. Mid-way through our dinner, we were surprised to be told by our server at 13 Mountain Street in Grimsby that the winemaker of the glass of wine one of us had just ordered was in the house and had graciously purchased the whole bottle to be shared at our table. We couldn’t resist discussing the marketing lessons – our last for the year – that could be taken from this. First, an arresting name is a powerful name. 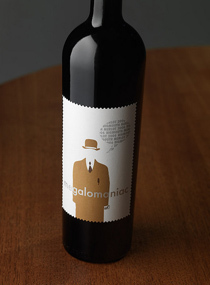 We were immediately drawn to our Megalomaniac Big Mouth Merlot. Second, people love a good story. The label told a short but amusing story about the people behind the wine and connected with us on an emotional level. Third, looking remarkable starts with being remarkable. The winemaker’s generosity made our first experience with this brand a remarkable one. Finally, of course, the product must deliver. And Megalomaniac Big Mouth did just that. It’s a great tasting wine. If it hadn’t delivered, all of the other stuff would’ve been just that…stuff. It wouldn’t have made a difference! It was a delightful surprise, a brilliant marketing move, and a little serendipitous – a bit of liquid encouragement at just the right time. Thanks, John Howard. Your friends may accuse you of being another megalomaniac, but I can testify that you have a big heart to go with that “big mouth” of yours. Today is the last day of work for us for 2010. The year seems to have flown by once again at a dizzying pace. We were privileged to work with several new clients, honoured to continue working with existing clients and took the time to reach out to many more who we hope we’ll have the opportunity to serve in the new year!